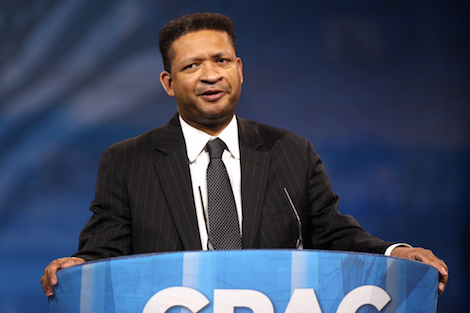 I don’t know how I missed the story that former Alabama Congressman Artur Davis, last seen nationally as the 2012 Republican National Convention’s big apostate speaker, and reportedly eyeing a congressional seat in his new home of Virginia, had returned to Alabama and run for mayor of Montgomery. He lost to incumbent mayor Todd Strange by a pretty healthy margin on August 25. But on election night he announced he would run again in four years–pretty much a century in terms of Davis’ rather fluid political career. “I have received a great deal of encouragement from my supporters in the mayor’s race to not only stay involved politically but to run for County Commission in District 1 in the March primary,” Davis said. Well, they don’t exactly line up with the Republican Party’s priorities anywhere, and didn’t in 2012 when Davis gave cover to Mitt Romney’s campaign and its savage, racially tinged attack on Davis’s old friend Barack Obama for a mythological abandonment of welfare reform. Davis’ old Alabama constituents–many of whom voted against him in the 2010 Democratic gubernatorial primary after he triangulated a bit too much–know him better than I do, and if they want to hire this once bright political talent for the county commission and/or to run Montgomery, that’s their prerogative. And I guess Alabama Democrats don’t have a whole lot of options these days. But I would hope that in the upcoming election voters would at least secure from Artur Davis a promise that he’s made his last party-switch.